John remembers growing up in The Trevor Arms in Vauxhall Road where his parents were the landlords in the 1930s, and their close relationship with Sparkes' Bakery. John was born and grew up in Vauxhall Road, where his parents were landlords of The Trevor Arms, opposite Sparkes’ Bakery. John is a born entertainer and his memories are recounted with great humour. Indeed, he breaks into song at one point during this clip. 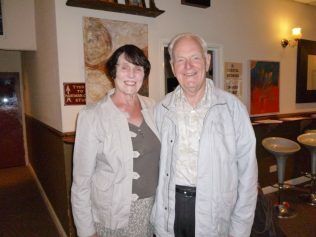 This photograph was taken in the Picturedrome in June 2011 with his wife Jeannette. You can find more of John’s reminiscences on this site here and here.